The cardiostrong exercise bike BX50: a user-friendly family exercise bike! The cardiostrong exercise bike BX50 is ideal for sport enthusiastic families and regular cardio training of leisure sportsmen. 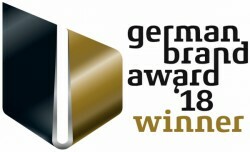 The balance mass of 9 kg and the very silent induction brake system provide a smooth and joint-gentle course of motion. Resistance is variable between 10 to 350 watt in 5-watt-increments, so that beginners and advanced users get their money worth with the cardiostrong exercise bike BX50. 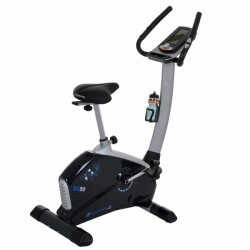 The training computer of the cardiostrong exercise bike BX50 can be intuitively used. Set your training settings within a short time with a knob and two buttons and start exercising. Thanks to user memory, up to four persons can save their training settings and use it while exercising. The cardiostrong exercise bike BX50 is excellent for exercising in families. The 17 programmes of the cardiostrong exercise bike BX50 provide diversity, four of them are pulse controlled. These programmes adjust the training intensity to your fitness level, so that you always exercise in your optimal heart rate zone. 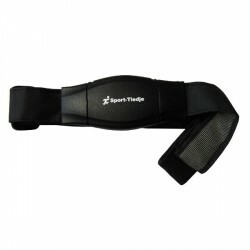 Pulse is measured by integrated hand pulse sensors of the cardiostrong exercise bike BX50. 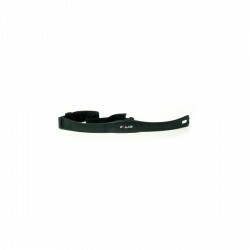 An optionally available chest strap can also be used. The cardiostrong exercise bike BX50 offers a big LCD display for controlling your workout. Besides a big speed display, you find training data like heart rate, watt, distance, etc.. The saddle of the cardiostrong exercise bike BX50 is well-padded for a comfortable training position. It is horizontally adjustable and also 10 times in height. A cup holder incl. bottle provides refreshment for challenging workouts. After the workout, the cardiostrong exercise bike BX50 can be comfortable moved with transport wheels. 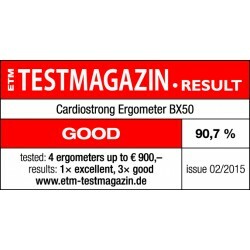 cardiostrong exercise bike BX50 add to comparison list.